I can’t see the video in any off my browsers. Wow. please add the depth effect to the first demo. That is incredible. Worked perfectly in Firefox 3.6.3 for Mac OS X. The second demo was a little slow, but the first one ran great. Worked on Firefox 3.6.3 for Windows XP. Both versions worked great! Yeah I’ve learned throughout the day that Firefox on Windows isn’t too problematic, it’s just Firefox on Mac that is dog slow in the 3D demo. Worked flawlessly on Windows 7 with Chrome. Really cool! What was that Adobe said about HTML5 video not being as advanced as Flash video? You just showed us HOW advanced HTML5 is! Works beautifully in Safari 4.0.5 on OS X 10.5.8 (even on this 1st Gen MacBook Air, notorious for having terrible video performance). I will note though that Safari froze solid for a good twenty seconds while loading each of the pages. Wow, this is great! Works great on Chrome 4.1.249.1045 (42898). No happiness on iPad, chrome on karmic works well. Safari on Mac Pro plays both flawlessly. Works well with Safari on a plain ol’ 2010 MacBook. No luck on the iPad. Didn’t do anything. Works just fine even on an Acer Aspire D250 netbook running Chrome. Is there a way to use already HTML5 in firefox for example? in Fire Fox 3.6.3 is runnig great! but in IE-8 it doesn’t work! Shows nothing on my iPhone. Transcoding the original MP4 to same-resolution Theora the performance is about the same for both in Safari (via XiphQT) and Chrome. Opera plays the full-resolution Theora just fine (earliest core2 mac mini), but doesn’t seem to want anything to do with the H.264 version. Firefox may or may not have problems (I don’t have it installed) but there’s no reason to assume they relate to video decode hardware acceleration. Could you provide the same resolution in both formats? Right now you’re penalising Opera artificially. works on opera 10.51 on win7. Chrome 4.1, FF 3.6.3 , Opera 10.50 both examples worked fine, the size of video on Chrome seemed larger and the “blow up” affected a smaller amount of video though, in FF and Opera it blew virtually all of it up with one click. Stunning stuff. Sweet in Chrome on Vista. Both fail in IE9 Preview (“Object no found” error at the line in Init() that says “copy = copycanvas.getContext(‘2d’);”). I’ve logged an issue with Microsoft. This technique opens up a nice venue of video sprites where you can use a single video file to store a whole bunch of animations in various sizes for in games. 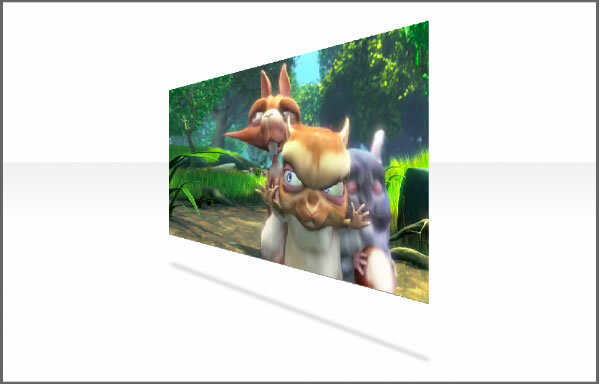 Does the HTML5 video API allow you to set a movie to a specific frame (or time?) Could be a very efficient way of storing animation data that way. Both examples worked surprisingly well on my “old” Dual G5 PowerMac using Safari. As others had stated though, no go on my iPad (well, the second example does show a rotating shadow). Does not work with Safari on Windows 7. Have a look at e.g.. Apple’s HTMLMediaElement-class-reference to learn how. Be aware of the fact that you provide the time in seconds, though! Works excellently in Opera 10.5. I can’t tell any noticeable difference between how fast Opera handles either compared to Safari on my computer. Opera certainly blows the pieces apart faster, but that could be just because there are less of them. Unsure why the video is smaller in Opera and Firefox, though. Are there certain plug-ins required? 3D video is awesome ! Alright Firefox and Opera users, the ogg video is now 640 x 360, enjoy. Ok – so I tried to replicate on my server so I could start playing with your math and start ripping it apart to try and understand it – but I cannot get the .ogv to play. I dl’ed it from you, and uploaded… do I need to re-encode? This ran super (no slowdowns at all) on Firefox 3.6.3 on Win7 32bit. Ran like crap in my Chrome, same OS/computer. CORRECTION: After revisiting the page in Chrome, I found it was only choppy because ,unlike Firefox, it did not wait when the network fell behind, it would stall then skip whenever the network caught up. It still does not loop properly. Awesome…I know this is just a demo, but my mind is already racing with possibilities. Great post. Is this optimized at all or just a proof-of-concept? Because it eats ~70% of one core and ~20% total CPU on my 2.4 GHz Machine. The slow performance copying out of the video tag is likely because the video is in the YUV color space, copying it to a Canvas will require converting it to the RGB color space (Every pixel needs to be converted individually which is, of course, murder on the CPU. It can be sped up but will require SSE/Neon/Altivec/etc optimisations but only if the blocks being copied are big enough; I’m betting most browsers don’t have those anyway). Rendering directly to a canvas means you get a bulk-transfer-bonus by doing the conversion all at once rather than piecemeal, same optimisation requirement applies though. So weird — when I put the video on my server it doesn’t play – it just wants to download – but on the craftymind server it plays. It there an .htaccess rule or server rule I should be aware of? Works better for me with Opera 10.52 RC for Mac than with Chrome 5 and Safari 4. Perhaps worthwhile removing the “best viewed in Webkit browsers”? Works great in Firefox 3.5.9 on Fedora 12. Andrew, that makes a lot of sense about the YUV to RGB conversion. I was naively assuming that a bitmap is a bitmap is a bitmap, and whether you grab that from a video raster or a canvas raster shouldn’t matter. Thanks for the explanation. In addition to what andrew said @54, I want to point out that while copying data from main memory *into* GPU memory is slow, copying *back* from GPU to main memory is even slower. If you do bulk operations on canvas data, the browser can (at least in theory) stream compressed video into the GPU memory and do all the manipulation there, which is relatively fast, but individual pixel manipulation has to come back to main memory, which crawls. I’m not sure how optimized this stuff is in the current generation of browsers, but making it go as fast as possible is on everyone’s roadmap. Having said that, both HTML5 video demos run beautifully in Opera v10.52 RC4 for Mac at full-resolution; so the “best viewed…” line is pedestrian. Give due credit to Opera developers. It’s a smokin’ desktop/iPhone browser that makes the agnostic Web better for users & easier for developers (especially with the full Cocoa rewrite on Mac builds now). Whaou ! Impressive effect ! iPad does not have ogg codec, only h.264. Html5 video is a container not a specific codec. That.s what the battle is about. I query your “best viewed” message, though. Opera 10.51 on my little Win laptop behaved impeccably too. And you compare this to what you can do with flash? Maybe pick up a flash book. Forget all of the platform problems. (just keep glossing over them). This level of code is beyond the vast majority of web site devs and it doesn’t even work correctly. To say this is somehow a ‘solution’ for a web site build is beyond naive. Are you telling me you would get paid for this? Hilarious. If you’re a hobbyist, great. Have fun. If you are a prfessional, HTML5 is not ready for primetime. If you are developing websites and you can’t work out this code, you my friend are shortchanging your customers and giving the industry a bad name. shows you are a windows, ie centric fool. emphatic, you are reading more into blog post then what I’ve stated. All I’ve done is show some code I’ve been playing around with, nothing more, nothing less. @thebear: sorry but html5 is really not ready… it’s not working same on all browsers. despite you dont need plugin (like flash), you need ‘right’ browser. what a win? me as flex/flash developer, i dont need to worry what browser you use… get it? what about ogg/h246 battle??? flash video playes everywhere same… no OS or codecs problems. i wouldn’t necessarily say that HTML5 isn’t ready. i’d say the browser support isn’t ready. Michael, try adding this to your .htaccess file. Hello, do you mind if I used the 3d video source code on my website? Please e-mail me if you have time. Thanks very much for the demos, I did not know this was possible! Worked like a champ on linux/chrome with an old video card, impressive! What the hell is the use of that? I don’t see why I’d ever need to blow up my videos or make them rotate like that. It’s sad how dysfunctional and pathetically slow HTML5 is! The effect is really awesome!! Congrats!! What about the control buttons? Play/Pause/Volume, etc?? 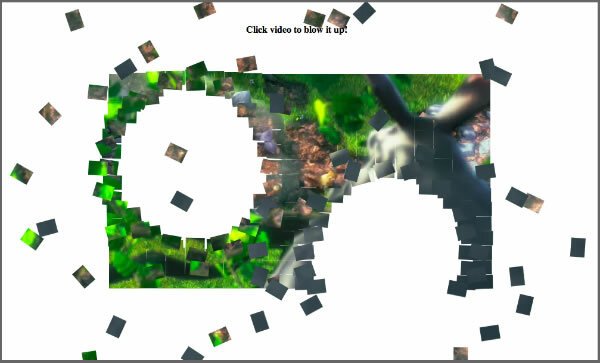 ¿Is it possible to do that over the video on HTML5? Pleeeeeeeeease! It’s so 80’s! Flask rocks! Ok step in the right direction, but how hard is this going to be for us UI designers/developers? For instance how many people are still having issues writing css that all browsers can read without having to hack it up a bit. IE, 6 -7 ring alarm bells! Hell talk about throw things back a few years. I know these browsers wont live for ever but there are still people still using these redundant old browsers, half the reason why flash was introduced in the first place – runs on all browses and platforms universally. The turn around time for open standards such as html 5 is too slow, and not everyone adopts them the same. At the current rate it’ll be another 10 years before its up to speed with flash, by that time we would have moved on. Things need to speed up before we can start using it properly. If you guys are that serious about it then make it work, create tools and flash equivalent applications that help designers use html5 in all its glory. While it appears to be the smoothest in Chrome (comparing Opera 10.53, Firefox 3.6.3, Chrome 4.1.249.1064 on a Phenom II 955 in Win XP) it also looks the ugliest on Chrome as Opera and Firefox apply anti-aliasing. Very good your post my friend ! Ugh, no perspective correction on the 3D? html5 has many interesting things, if the html5 standard has been confirm, many things need to study too. omg, that’s *** awesome! I can see that on a production website. This is so awesome. 3D space will be apart of the Web3.0 age. Being able to blow up video files is definitely why we all need to switch over. This is like the cure for cancer. We can all happily blow our video files from now on with our new html5 overlords. Thank goodness me!